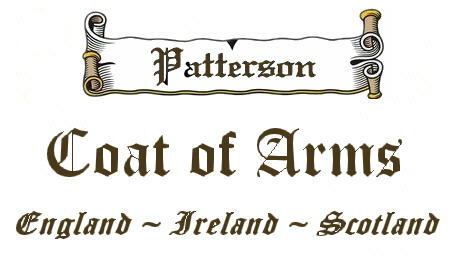 "New Coat of Arms of James Patterson, 1680, Ireland"
The main heraldic symbol in the Patterson Coat of Arms (erroneously called the Patterson Family Crest) is the pelican. The pelican is often associated with parenthood and “devoted and self sacrificing charity”. 949 It is almost always shown with its young in their nest (in its piety) or pricking its breast in readiness to feed its young with its own blood (vulning herself). 1) Ar. on a fesse az. three fleurs-de-lis of the first.-Crest, a pelican or swan, in her nest, close, vulning her breast, all ppr. 2) Ar. three pelicans or, in their nests vert, vulning themselves ppr.-Crest, a naked arm, erect, holding a pen ppr. 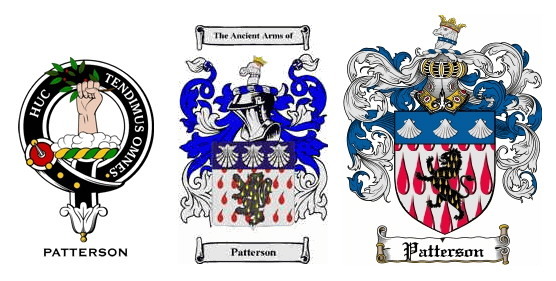 The last name Patterson or Paterson has several origin theories or meaning. 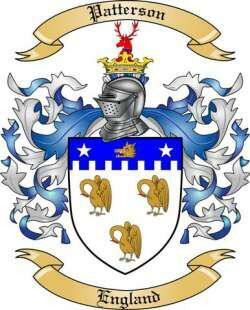 First, this is a Scottish or northern English baptismal or patronymic surname meaning “the son of Pate” or “the son of Pate”, with Pate being a reduced form or nickname for the personal (first) name Patrick. In turn, the masculine given name Patrick derives from the Latin word patricius, meaning a patrician (the Roman hereditary aristocracy) or nobleman, a name popularized throughout Britain (particularly Ireland) by St. Patrick (around 385-461 AD), whose birth name was actually Sucat, who was a Christian Briton and citizen of the late Roman Empire who became a missionary to (and patron saint of) Ireland. The personal name was used seldom before the 1600s, as it was considered too sacred, but became extremely common thereafter. 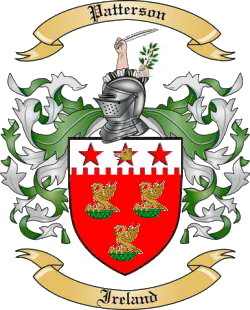 A second theory is that an Irish last name in Ulster (of English/Scottish origins) and Galway, which is an Anglicized version of the Gaelic surname Ó Caisín, meaning “descendant of the little curly-headed one”, deriving from the Gaelic word casán, typically Anglicized to Cussane (meaning “path”) or Kissane, the later becoming obsolete. 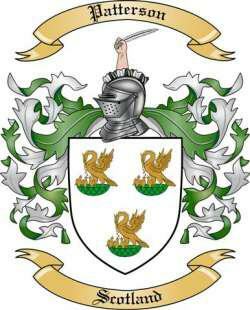 Originally, the family (Clan Pheadirean) owned lands in northern Lochfyne. In Ireland, this last name was first established in Connacht, where it was one of the eight Sodhans (septs located in Hy Many or Ui Maine). 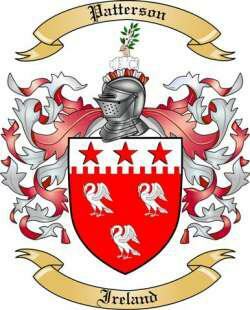 In Scotland, the name was first found in Ross-shire, which emerged from the Gaelic lordship of the Earls of Ross. 2) Patterson, of Dry Grange, Roxburgh, Scotland, (See Wilkieson), 1779. Page Design by: " K o o l S t u f "